5 full tests fully aligned with the revised Cambridge IGCSE First Language English 2020 syllabus. 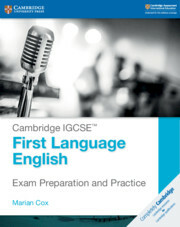 Ideal for use in the final year of the Cambridge IGCSE First Language English course, this book provides scaffolded support for students approaching the examination. The book contains five full examination papers organised by task type, accompanied by model and sample responses, mark schemes, examiner grades and comments, learning and exam strategy training, and examiner tips. One book with answer key included, designed for classroom use. Written by experienced teacher, examiner and author, Marian Cox. The Assessment for Learning approach provides deeper insight, structure and support on long-form writing questions. Includes an introduction to the revised syllabus and examination. Three guided reading papers, organised by question, including questions, exam strategy training, examiner tips, mark schemes, and A* model answers. Three guided writing papers, organised by question, including questions, exam strategy training, examiner tips, mark schemes, annotated sample responses at 3 grade bands and sample plans. Two full exams with full mark schemes. Helps learners develop metacognitive learning skills such as noticing, peer assessment and redrafting.